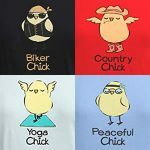 [ 100% Chick T-Shirt ] The softest, most comfortable t-shirt I’ve ever owned. 100% cotton. Many cute designs/colors. Made in USA by a family own business. Read my post for more details! [ American Giant ] I ended up with a few of their heavyweight hoodies. It’s sturdy with good construction so you don’t look like a blob in it. Free return takes a while to ship back but refund was quick after it’s delivered. Look in my post for my review! [ LloydPans Bakeware ] These made in USA LloydPans’ non-toxic, stick-resist, light-weight pans made my life in the kitchen much easier and more efficient. I never had to oil these pans and clean up is a breeze. Read more about why I replaced my old bakeware with LloydPans dark coated pans. 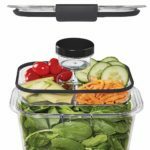 The Rubbermaid Brilliance Food Containers collections are BPA free, air-tight, made in USA, see-through, freezer safe, microwave safe (lid w/ vent holes), stackable, comes in many shapes and sizes. I use them for bulk items, read how I use Rubbermaid Brilliance. 100% plant-based scrubber sponges. See my review compared with the Full Circle version. 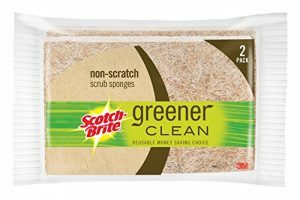 I also use Scotch-Brite Greener Clean Absorbent Sponge. Luminarc Working Glasses are perfect as drinking glasses or to store food. 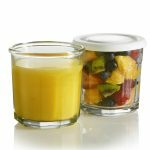 For storing liquids, be sure to get lids (lids are made in France, glasses are made in USA), not air tight but it stays on to prevent a big spill! Comes in various sizes. [ Pourfect Measuring Spoon Set ] I have yet to find stainless steel set that’s made in USA. The Pourfect set is the best I’ve got. It has odd sizes so it wins over the only other USA made measuring spoon I’ve found. 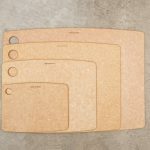 [ Epicurean Kitchen Series Cutting Board ] I’ve been using this cutting board for many years and sees very little damages. [ If You Care Cheesecloth ] Unbleached, 72″ x 36″, fold over if you want a finer filter. [ Rubbermaid Easy Release Ice Cube Tray ] Truely easy release as claimed, BPA free. [ Spiff Cloth ] Everyday cleaning without chemicals–Read my post! Best for smooth surfaces, like glass/metal. (clean oil spots well but not for old grime/dusts) For streak less finish, squeeze out as much water as you can before wipeing. Otherwise, it cleans well with more water, too. [ Folex Instant Carpet Spot Remover ] Folex pushed another brand down from #1 for spot carpet cleaning. No smell, no residues of any kind, cheap, easy to use, just read my post. I liked it so much I got the gallon refill. It even works with your carpet cleaning machine. [ Dr. Bronner’s Organic Liquid Soap ] Anti-bactial soap is making bateria stronger. Swith to Dr. Bronner’s Organic Liquid Soap for hand washing. Remember to dilute it, if not you’d be rinsing it off for a while. It’s also amazing on spot washing fabrics. I only get the unscented version but it comes in many scents. 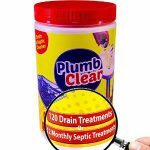 [ PlumbClear Non-Toxic Drain/Septic Cleaner ] I first used it to clear slow drains and once for a slight emergency. I love that PlumbClear is enzyme and bactiral based, plus, it won’t hurt our old pipes. Be sure to follow instructions for the solution ratio and activation time. Trust me, it’s worth the wait! 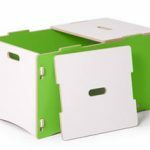 [ Storage Box ] I needed a room storage solution with clean lines and found Sprout Kids who designs and make their modern kids furniture in USA. Comes in other colors and unfinished, too. Uses safe and recycled material! [ Nexcare Bandages ] Don’t assume US brand bandages are made in USA. So far I only found Nexcare by 3M and Target’s Up & Up bandages are made in USA. [ Cedarcide Non-Toxic Bug Spray ] Deet-free, made from Texas cedar oil and hydrated silica, can be used on you body and home.